Born in Omodos, Cyprus in 1940. Education: Law degree, The University of Thessaloniki, Greece, 1974. University of Leicester (Anglo-Cypriot Legal Studies), 1988-1989. Until 1978, he worked for the Cyprus police force as a prosecutor as well as in the immigration department. 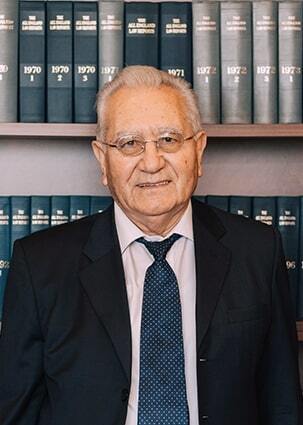 From 1978 until December 1997, he worked as an in-house lawyer at the Town Hall of Nicosia. Member: Cyprus Bar Association since 1975. Practice Areas: Litigation, inheritance law, landlord and tenant, wills and probate, personal injury claims, planning, land law, municipal law, commercial crime.